As many of you know, I am a meditation advocate and I know very well how important meditation is for me, and for all of us on our spiritual journey. Meditation truly helps to unlock the key to the soul, and when you meditate properly, it can release a tremendous amount of stress, negative energies, long runs of ‘bad luck’, and so much more. What I’ve uncovered over the years is that a lot of people want to meditate, but they don’t really know how to start or where to begin. Meditation is a lifesaver for so many of us and is the key to making powerful connections to the Other Side and beyond. 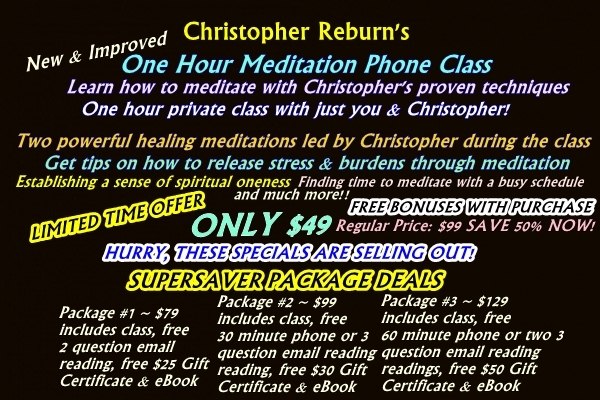 Join me this summer for a one hour meditation class geared to your specific spiritual needs, and I’ll share some of my very own meditation exercises and give you some great examples for you to use for your spiritual meditations. Finding spiritual peace begins with meditation! I’m so excited to unveil my new and improved one hour meditation classes. I’m finally ready to begin teaching them and I’ve made sufficient room in my schedule to accommodate all of you who are ready to learn, and take the next step on your spiritual journey. If you’ve taken one of my courses before, or have wanted to take one, this one hour meditation class would be great for you! I look forward in sharing this spiritual adventure with you! SPECIAL $49 OFFER: Reserve your class today and you'll save $50 off the regular class fee, plus you'll also receive some great free bonuses with purchase! Limited Spaces available for this special offer. This offer likely will sell out before it expires on July 31! Offer ends when sold out. 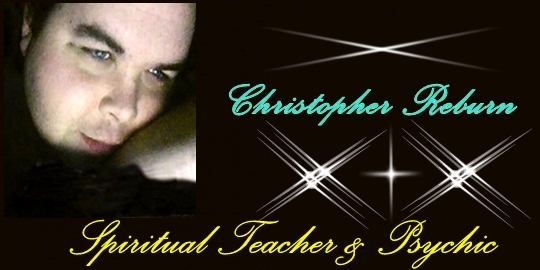 FIRST 50 PEOPLE TO REGISTER WILL BE ENTERED TO WIN A FREE 3 MONTH COURSE with CHRISTOPHER! click the 'BUY NOW' button below! Question: Is this class only available during August, September & October 2016? No gift certificates or discounts of any kind will be accepted on this already heavily discounted offer. All sales are final. There are no refunds or exchanges.